Organized July 16, 1848, largely through the efforts of Isaac Leeser; one of the oldest societies of its kind in the United States. 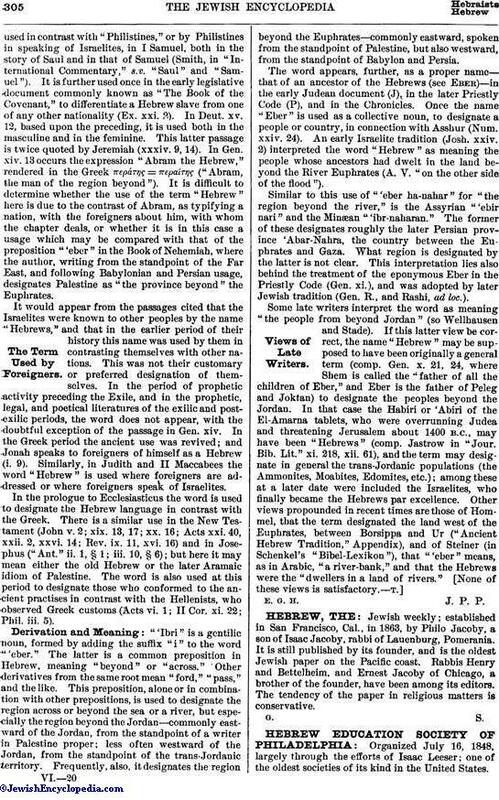 The charter granted by the Pennsylvania legislature April 7, 1849, authorized the establishment of schools for general education, combined with instruction in the Hebrew language and literature; the charter also authorized the establishment of a "superior seminary of learning," with power to grant the usual degrees given by other colleges. A supplementary act, passed May 13, 1866, allowed the admission of its pupils to the Boys' and Girls' High School, Philadelphia. The first school of the society was opened on the upper floors of the Phœnix Hose House on Zane (now Filbert) street. The first session was held on Monday, April 7, 1851. Early in 1854 the society received a legacy of $20,000 from the estate of Judah Touro; in May following, the purchase of a church building on Seventh street, between Wood and Callowhill streets, was authorized; the school removed into this building in October of the same year. In January, 1889, this building was sold, and the school, now known as Hebrew School No. 1, removed to Keystone Hall, 1204 Germantown avenue. Maimonides College was opened Oct. 28, 1867, and remained in existence until December, 1873. Hebrew School No. 2 was opened March 3, 1878, in the synagogue building of the Holland Schule, Fifth and Catherine streets; it subsequently removed to Wheatley Hall, then to 322 Bainbridge street, and finally to the society's building, Touro Hall, at the southwest corner of Tenth and Carpenter streets. Hebrew School No. 3 was opened October, 1879, at Marshall street and Girard avenue, and in December following Hebrew School No. 4 was opened at 624 Wayne (now William) street, in the district of Richmond. Hebrew School No. 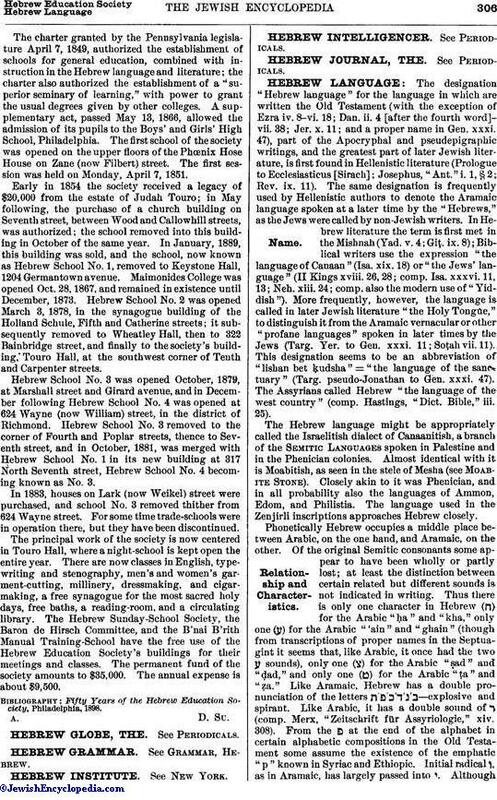 3 removed to the corner of Fourth and Poplar streets, thence to Seventh street, and in October, 1881, was merged with Hebrew School No. 1 in its new building at 317 North Seventh street, Hebrew School No. 4 becoming known as No. 3. In 1883, houses on Lark (now Weikel) street were purchased, and school No. 3 removed thither from 624 Wayne street. For some time trade-schools were in operation there, but they have been discontinued. The principal work of the society is now centered in Touro Hall, where a night-school is kept open the entire year. There are now classes in English, type-writing and stenography, men's and women's garment-cutting, millinery, dressmaking, and cigar-making, a free synagogue for the most sacred holy days, free baths, a reading-room, and a circulating library. The Hebrew Sunday-School Society, the Baron de Hirsch Committee, and the B'nai B'rith Manual Training-School have the free use of the Hebrew Education Society's buildings for their meetings and classes. The permanent fund of the society amounts to $35,000. The annual expense is about $9,500. Fifty Years of the Hebrew Education Society, Philadelphia, 1898.